First Solar, Inc. (FSLR): Will This Be the Breakout Year for Alternative Energy? Proponents of alternative energy such as solar and wind power have fought a long uphill battle. For years they’ve tried to prove that these energy solutions were not only more ecologically friendly, but also that the potential, long-term returns made them a better investment. Well, it appears as though this year might finally be when average investors stand up and see that investing in alternative energy companies is not the wild roller-coaster ride it once was. Let’s look at the most recent developments in the space and see how alternative energy might lose the “alternative” moniker. The biggest gripe with alternative energy, notably solar, is that it can’t compare with fossil fuels because the per-watt costs were too high. Thanks to developments in the technology, this is becoming less and less the case. According to a report in The Economist, the average cost for a solar installation per watt produced has dropped 99.14% since 1977 and is now about $0.74 per watt produced. When considering additional installation costs, an average solar facility will run about $4.00 per watt, which is pretty reasonable when compared with the $3.00 per watt needed to build a coal-fired facility. One example of improving efficiency from solar is First Solar, Inc. (NASDAQ:FSLR)‘s Macho Spring facility in New Mexico. The 50-megawatt solar farm will sell power to El Paso Electric Company (NYSE:EE) for 5.79 cents a kilowatt-hour, less than half of what El Paso Electric Company (NYSE:EE) pays to buy power from coal plants. A large uptick in manufacturing has also helped First Solar, Inc. (NASDAQ:FSLR) start to realize even further cost reductions. Today, the company sports one of the lowest per-watt costs at about $0.66 today, and the cost is expected to lower by another 33% in four years. First Solar, Inc. (NASDAQ:FSLR) isn’t the only one, either. Back in February, General Electric Company (NYSE:GE) submitted a thin film solar cell to the Department of Energy, recording the most efficient solar cell ever made. Having these two companies duking it out over who can build the most efficient solar cell stands to benefit the industry as a whole. Can alternative energy find its second wind? In terms of new installations, 2012 was the best year ever for wind. More than 13 gigawatts of wind generation were added last year, a 28% increase. Globally, wind generation capacity has doubled every three years. If we stay at this pace, wind could surpass nuclear generation within a decade. So far in the U.S., development of wind projects has been helped by the Production Tax Credit to encourage alternative energy generation. It was set to expire at the end of 2012 (hence the large jump in 2012 installations), but it was extended throughout 2013. The uncertainty of this tax credit will hurt wind energy growth, but the industry is starting to stand on its own as well. According to Bloomberg New Energy Finance, electricity prices from wind have dropped 21% since 2010. 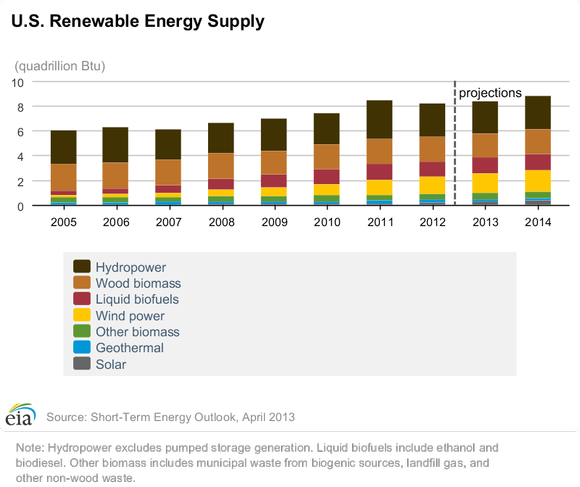 Although wind projects are supposed to slump in 2013 — only 6% growth — it’s expected to see a 14% jump in 2014.